February is the month of high-profile executions in Tudor England – there is Mary, Queen of Scots on the 8th in 1587, Lady Jane Grey on the 12th in 1554 and Katheryn Howard on the 13th of 1542. 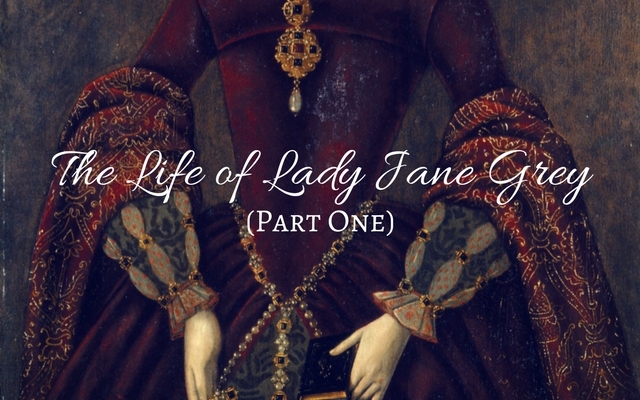 In this new series I have chosen to focus on the life of Lady Jane Grey. Recently I finished reading ‘Crown of Blood’ by Nicola Tallis and ‘The Sisters Who Would Be Queen’ by Leanda DE Lisle, as well as referencing Eric Ive’s biography on Jane. Along with my fascination of Thomas Seymour, Jane Grey’s life nicely intertwined with that of his and is a fantastic story to share with all of you. As granddaughter of Mary Tudor, dowager queen of France and Duchess of Suffolk, Lady Jane Grey was born with royal blood flowing through her veins. As the eldest surviving child of Frances Brandon and Henry Grey she received the education that normally would have been given to the eldest son. Some even believe Jane was better educated than Elizabeth Tudor. 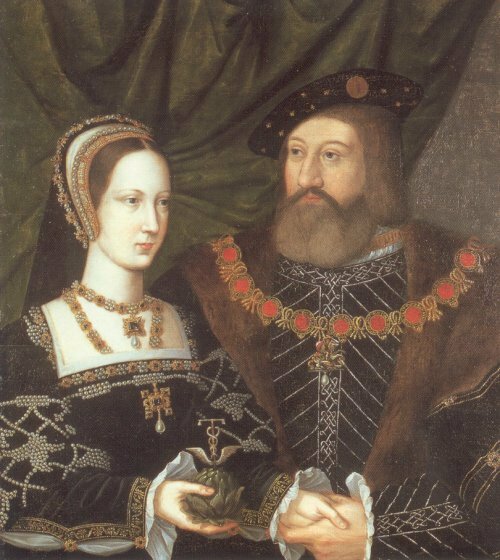 Mary Tudor and Charles Brandon, Duke of Suffolk and queen of France. As is usual with royal children, Jane was cared for by a wet nurse. It was considered unfashionable, and frowned upon, for a woman of royal status to breastfeed her own children. Choosing the perfect wet nurse was of utmost importance to Frances Grey – she was the daughter of a Tudor princess and a dowager queen, and so her daughter Jane was royal. It is unknown who Jane’s wet nurse was but it is highly likely that whomever it was had been chosen by Frances Brandon herself. 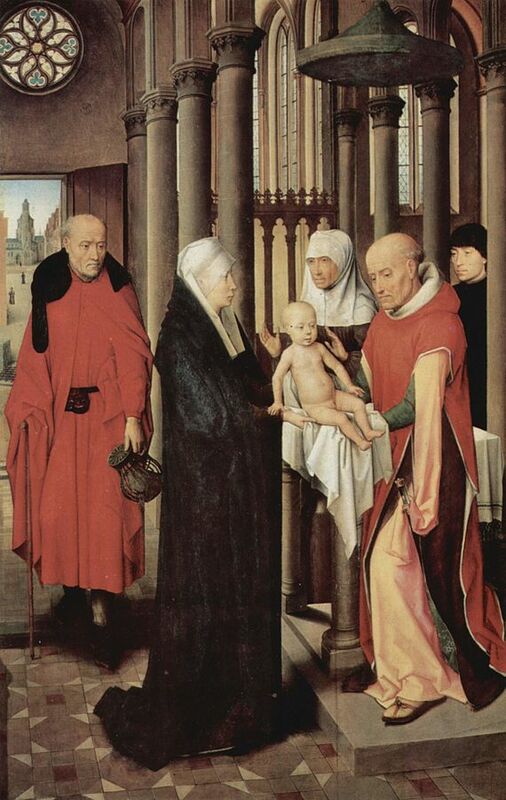 Jane was not only suckled by a wet nurse but she also had a nursery staff which included rockers. A rocker’s job was to rock the infant to sleep and to soothe the child when necessary. Presentation in the Temple, a representation of the presentation of Jesus at the Temple upon which the churching of women is based. (Hans Memling, c. 1470, Museo del Prado. Madrid). A woman who becomes pregnant and gives birth to a son will be ceremonially unclean for seven days, just as she is unclean during her monthly period. On the eighth day the boy is to be circumcised. Then the woman must wait thirty-three days to be purified from her bleeding. She must not touch anything sacred or go to the sanctuary until the days of her purification are over. If she gives birth to a daughter, for two weeks the woman will be unclean, as during her period. Then she must wait sixty-six days to be purified from her bleeding. With Jane being born in the latter half of 1536 she would have only known an England that did not include Anne Boleyn, as well as not knowing religion that included the Pope. She was raised Protestant, like her cousin Elizabeth – it was the only religion either ever knew. Education played a very important role in Jane’s life. It was of greatest importance to her father, who had been well educated himself, that his daughters learned all that he was taught and more. In this new England it was not frowned upon for girls to be educated. At five years old Jane began her formal education. In the beginning she began like most of us, learning her alphabet which lead to reading and writing. She would have also learned and memorized the Lord’s Prayer, in English – this was of utmost importance – education was not only learning to read and write but to build a strong relationship with the Lord. Jane proved to be a enthusiastic student who loved to learn and was eager to be taught. This was something her first teacher, Dr. Thomas Harding would have noticed immediately. It was around 1541 that the well-known tutor John Aylmer joined the household at Bradgate as tutor and chaplain – he had been invited by Jane’s father. Aylmer once commented on Jane’s intellect by saying, “God has fit to adorn with so many excellent gifts”. Jane flourished under the guidance of her new tutor and everyone, including her parents were pleased with her progress. It has always indeed been my disposition not only to set the highest esteem upon all kinds of learning, but to regard with the greatest affection those who cultivate and profess it. For I well know how brutish this life of our would be, were not the understanding of mankind cultivated by useful learning and liberal pursuits. It was under Aylmer that Jane’s enthusiasm for religious reform grew. But as always it wasn’t only learning from books and religion that Jane learned, but also the traditional forms of education to prepare woman for Tudor court – she would have learned etiquette, how to sew or embroider, how to dance and play musical instruments. Jane excelled at history and learning languages. She spoke Greek and Latin, as well as Italian and Hebrew. She also learned French as well as other languages. For Jane, books filled the void from the lack of age appropriate companionship at Bradgate. Her sisters Catherine and Mary were younger than her and Jane was happiest when she was inside reading. While her sisters preferred to play outside. As with any noble, or aristocratic child, Jane approached adolescence and needed to further her education within a household of an equal or someone of superior nobility. Henry Grey had indicated that his eleven year old daughter became the ward of Sir Thomas Seymour in February 15473 and was sent to Seymour Place in London- this was not long after the death of King Henry VIII and prior to Seymour’s marriage to the dowager queen, Kateryn Parr. Historian, Eric Ives believed that Jane’s parents were aware of Seymour’s intentions to wed Parr and that they were pleased with the arrangement. Sir Thomas Seymour had proposed to purchase Jane’s wardship from her parents Frances Brandon and Henry Grey. Grey and Seymour were well acquainted. Seymour attempted to entice the couple by offering them 2,000£ for Jane’s wardship. When that didn’t seem to do it he said he would also arrange a marriage between Jane and Edward, the king. Jane’s parents jumped at the chance for their daughter to be queen consort and allowed Seymour to purchase the 2,000£ wardship. They would have also seen the benefit of their daughter being in the presence of the dowager queen, who was a Protestant. Parr was already known for her care and education of the Lady Elizabeth. Elizabeth had the best tutors and mentors around – the same would be fore Jane. This offer from Seymour was in stark contrast to an offer made by the Lord Protector and his wife. The Somersets had attempted to arrange a marriage between their son and Jane. It seems both Seymour men, Thomas and Edward, understood how powerful of a chess piece young Jane could be. It was in her new household that Jane appeared able to spread her wings – she felt a freedom with Seymour and Parr that she had not experienced under the wings of her parents, as any child would feel being removed from their parents in their youth. She also was able to enjoy the company of the beautiful Parr. With Parr as a role model, Jane grew fond of beautifully styled hair and fine clothes, as well as a love of music. These were things that her tutor Ascham would later inform her were not of the Protestant way. It was in this household that Parr had arranged the best tutors for Jane and she thrived in her studies on religion and became more convicted in her reformed views. Jane’s parents, after a while, were concerned that progress was not being made in a marriage between Jane and the King since the Lord Protector had blocked both Seymour and Parr from seeing him. Seymour reassured them that he was indeed the King’s favorite uncle and that all would be well in due course. Jane, under the care of Seymour and Parr would have come across her cousin Elizabeth. Elizabeth was a few years older than Jane and so she was not as interested in interacting with her, not to mention that Elizabeth had always understood how precarious her position in the line of succession was since she was still considered the illegitimate daughter of the late king. Jane may have seemed to be a threat to Elizabeth’s future. Even though they had not spent much time together, Jane would most likely have been witness to Seymour’s attention toward the Lady Elizabeth. Once can wonder what Jane’s feelings were on the matter. 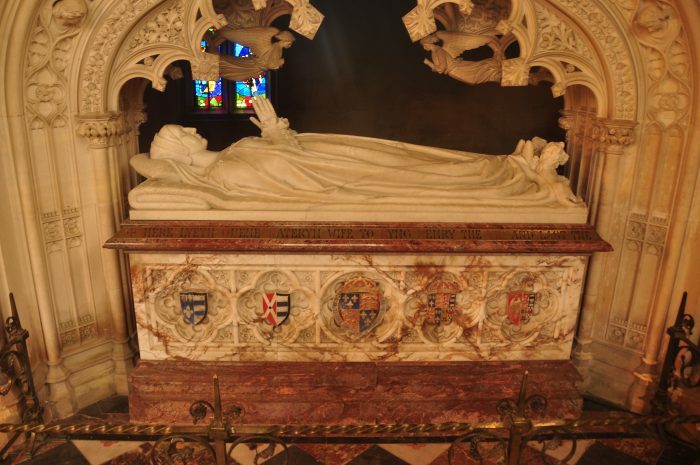 Jane Grey spent a total of a year and a half under the wardship of Seymour, but it all came to an end when Parr succumbed to childbed fever after giving birth to a daughter, Mary. At the service, Jane became the Chief Mourner in the first ever Protestant funeral in England. After the death of his wife, the grief-stricken Seymour chose to disband the household and to send Jane back to her parents at Bradgate. It was after Jane returned to her parents at Bradgate that Thomas Seymour realized he had made a hasty decision. He wrote to Jane’s father on the 17th of September pleading with him to return Jane to his care. He explained that he understood Jane’s mother would be concerned that her daughter no longer had a strong female influence in her life, so Seymour reassured her that all the ladies and maids of honor of the dowager queen would be kept on at Sudeley – continuing with the theme that Sudeley Castle was home to the second court as when Parr was still living. He insisted that everyone would be ‘as diligent about [Jane], as yourself would wish’.4 He also reassured them that Jane would return to Sudeley under the supervision of himself and his aged mother, Margery Wentworth and that he would care for her as she was his own daughter. My duty to your lordship in most humble wise remembered, with no less thanks for the gentle letters which I received from you. Thinking myself so much bound to your lordship for your great goodness towards me from time to time that I cannot by any means be able to recompense the least part thereof, I purposed to write a few rude lines unto your lordship, rather as a token to show how much worthier I think your lordship’s goodness, than to give worthy thanks for the same; and these, my letters, shall be to testify unto you that, like as you have become towards me a loving and kind father, so I shall be always most ready to obey your godly monitions and good instructions, as becometh on upon whom you have heaped so many benefits. And thus, fearing lest I should trouble your lordship too much, I most humbly take my leave of your good lordship. Jane’s parents were not convinced that sending their daughter back to Sudeley was the best course of action. With the death of the dowager queen Seymour’s status had dropped dramatically. Seymour, never happy to accept no as an answer, grabbed a horse and his friend William Sharington and they both headed to Bradgate. Thomas Seymour knew that he was very convincing in person. Once at Bradgate, Seymour and his friend Sharington used their wits and charms to the best of their abilities and convinced the couple that he would make good on their initial agreement. His only obstacle was access to the King. 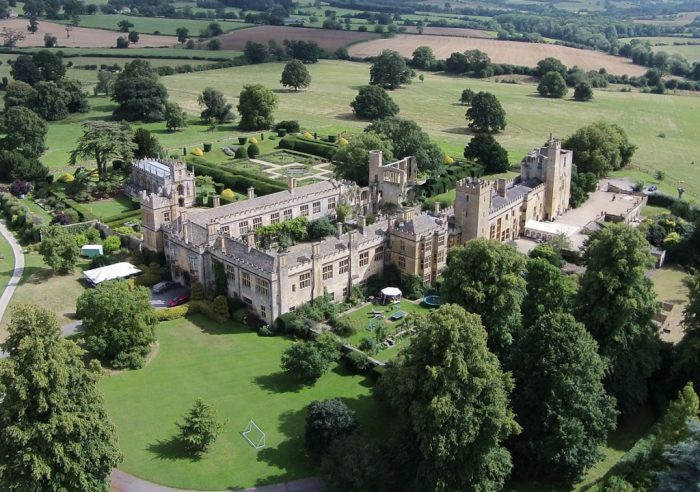 The Greys were convinced and (probably against their better judgement) sent their daughter back to Sudeley Castle under the care of Thomas Seymour. The Sudeley Castle that Jane returned to after the death of Katheryn Parr’s had a heavier feeling in the air than before . There was a noticeable change in the mood at the castle and it appeared that Seymour had not yet accepted her death. He had often spoken about presenting a Bill to Parliament that would stop people from slandering his late wife’s name. It was her marriage to Seymour that tarnished her reputation. Around this time there were rumors that Seymour was looking to remarry. Some believed he would try and wed the Lady Mary, or even Jane herself. Others believed he was after a marriage with the Lady Elizabeth, which he replied that he had heard his brother would lock him away in the Tower if he should marry her, but that he did not see anything wrong with a marriage with the Lady Elizabeth if she were to agree to it. The further Seymour moved toward a possible marriage with the Lady Elizabeth the more concerned those around him became. His friends and those who served him tried to change his mind – that it was against all that was decent for a man of his birth to go after an heir to the throne of England. One even warned him saying, “It were better for you if you had never been born, nay, that you were burnt to the quick alive, than that you should attempt it.” Seymours plan not only risked his life but also the reputation and life of the Lady Elizabeth. It wasn’t long after that Jane witnessed her father arriving at Sudeley to have secret meetings with Seymour. Henry Grey may have believed after these meetings that there would be a double wedding in the near future: His daughter to the King and Seymour to the Lady Elizabeth. When the arrests of those involved in Seymour’s plan began Jane was returned to Dorset House – her parent’s home in London. It was there she would have tried to wrap her head around all the accusations against the man who she had known as a father. It didn’t take long for Seymour to be railroaded and found guilty of treason, and on the 20th of March he was executed by beheading. That’s where we will end for this week. We will continue on with her story in Part Two of the series on Lady Jane Grey. I loved every bit of this and look forward to it’s continuation! Lady Jane holds a special place in my heart, for it’s her story that started my lifelong love of studying British history. Many, many thanks.